Here’s the necropsy report for the day. Yesterday I visited a friend who has chickens in the city, and her birds were fine; today she called with a dead hen. The hen had died between 2 PM and 4 PM today. The hen had laid (and eaten part of) a soft-shelled egg. 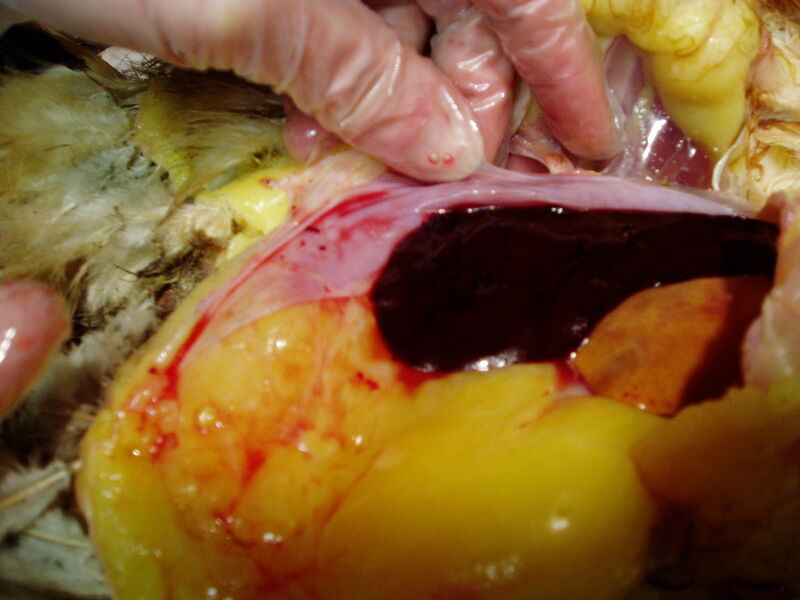 When I opened her up, I found a HUGE amount of fat and a massive amount of blood in the body cavity, seemingly a liver hemorrhage. 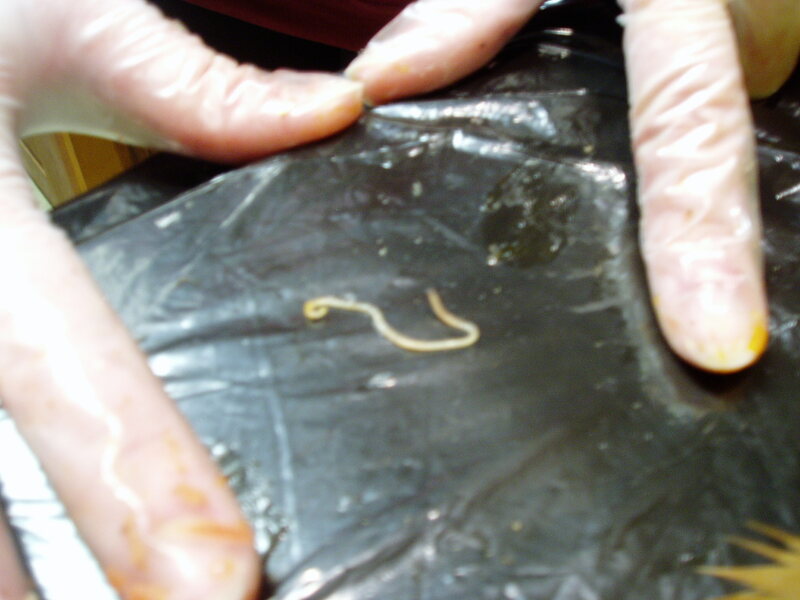 In addition to the liver issues, she had a nice collection of ascaris (roundworms) in the intestinal tract (one was over 2 inches long). 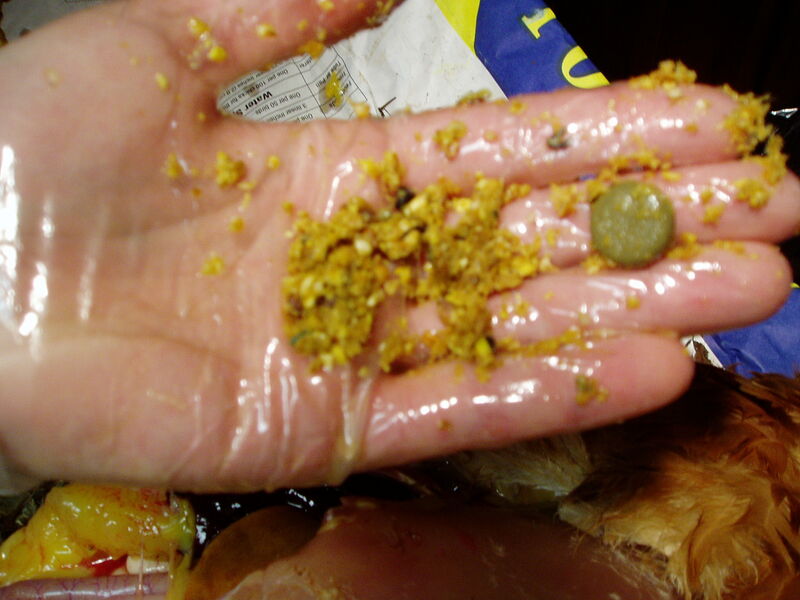 Her gizzard contained very little grit and a large amount of grains/vegetable matter and some plastic pieces. Dr. Sakas of Niles Animal Hospital reviewed the necropsy pix and said that the underlying comdition was the fatty liver, and death was caused by an aneurysm. 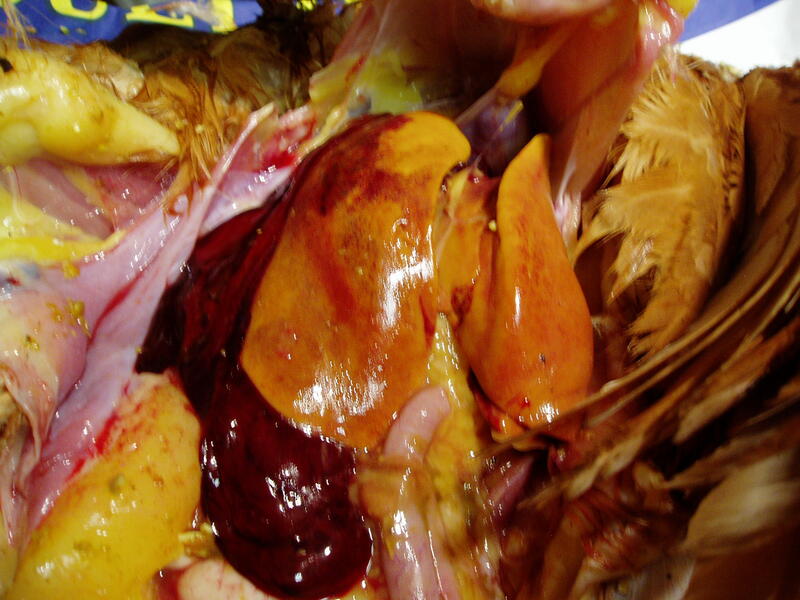 She died shortly after laying an egg, and the strain of egg laying can cause a hemorrhage. My friend doesn’t overload her birds with bread, mealworms, or other treats, but as I observed the birds eating from the feeder, they were picking out the bits of corn and leaving the mash. I advised her to feed a finely ground mash without the bits of corn, a crumble, or a pelleted food to prevent the hens from picking the “marshmallows” out of the “Lucky Charms” and leaving the “cereal” behind. I also suggested minimizing the amount of food available to the birds, limiting it to about 1/4 lb per bird per day. More exercise would probably be beneficial, too. The pictures below are not for the faint of heart! Well, today was a double-header. This afternoon, I consulted to a family off the Mag Mile who very kindly rescued baby chicks from a less-than-ideal situation after they were hatched at a school. There are two little ones who are doing their best to hang on. Then I moved on to a family who lost a hen for unknown reasons. 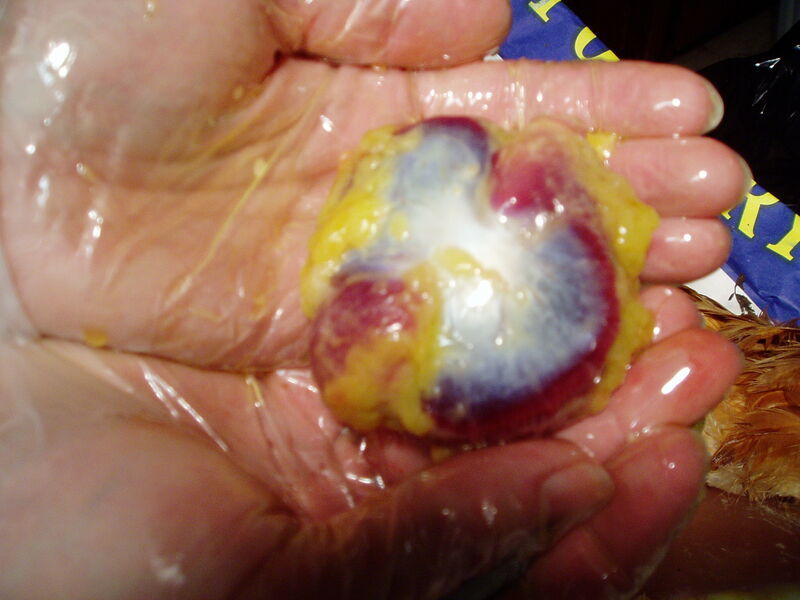 Necropsy revealed a very impacted crop due to grass clippings and a thin-shelled egg, broken in the oviduct. Last night I went out on a call for a chicken that had a hard crop. I suspected impacted crop. The owner said the crop had been hard for a while and that she was lethargic and hadn’t eaten in a while. He isolated her in a carrier in the basement and put a heater in to keep her comfortable. I arrived, expecting to treat a crop impaction, but instead found that Hildegard the buff Orpington was listless and lethargic. She had an empty crop and lots of poop. So the crop and GI system were doing ok; however, she had not eaten since the owner isolated her. I gave her an external exam and checked the poop. There was nothing abnormal in the external exam, but the poop yielded a stone and a full kernel of wheat, which made me wonder if there was something wrong with the gizzard. It also looked like she had chipped her beak. My recommendation was that the owners keep the hen warm and isolated and see an avian veterinarian; without the ability to know what was going on internally, this was beyond me. I recommended several avian vets in the area and asked that the owner follow up with me. It’s always difficult for me when I am unable to help a chicken. They can stymie even the avian vets; birds are good at hiding sickness, and by the time you know they are not feeling well, it’s too late. More on this topic (subclinical illnesses) to come! Today’s emergency call was a hen with white, watery liquid in her fluff and some odd stuff happening in and around the vent. The owner did a fabulous job of documenting the case in his initial email query to me: the other birds, symptoms, behavior changes, description of eggs. He even included pictures! My best guess without seeing her was uterine prolapse. I asked the owner to isolate her from the flock to prevent spread of contagions and also keep the other hens from picking at any odd things at her back end (yes, chickens do this!). The owner did exactly as instructed, and I found the hen resting comfortably in a wire cage under the porch. Her crop was full, which I was pleased to find! Getting down to business involved gently removing the white urates on her vent and fluff. When they were cleared away, I found a tiny piece of eggshell and part of an egg membrane protruding from the cloaca. This was the major key to the solution. 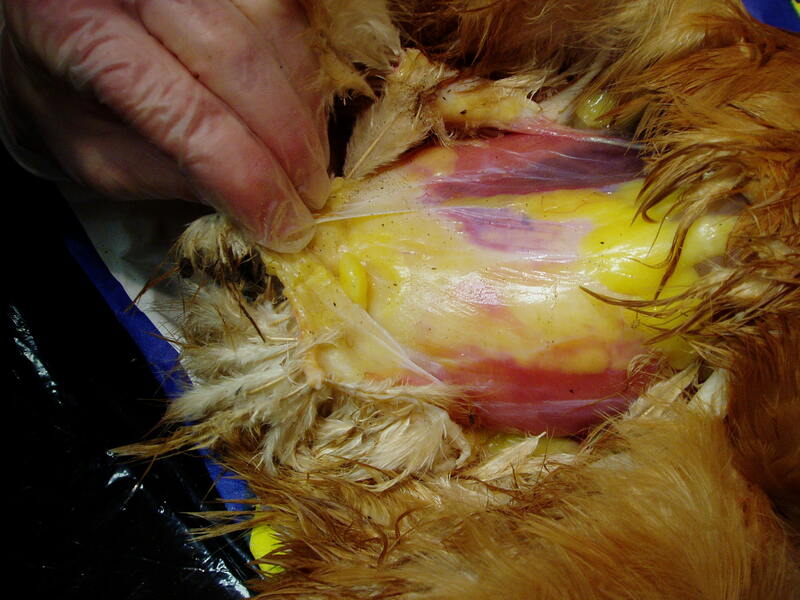 The hen had a soft-shelled egg broken inside of her. I gently cleaned Maisie's vent with soap and water. She fretted a bit when I gently pulled on the membrane, but it stimulated her to bear down, and the piece of shell membrane came out. I was hoping it would bring the rest of the egg with it, but no such luck. I was about to attempt a warm water bath when I discovered that I could stimulate her to bear down, and she passed the rest of the egg! 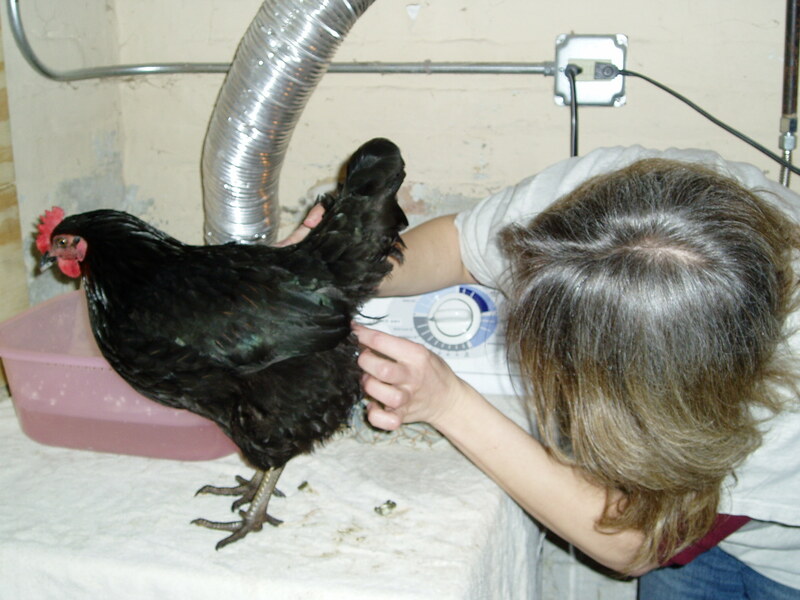 Besides, the hen did not really want to sit in a pan of warm water and kept perching on the side of the tub! This is what was giving Maisie such a hard time! I cleaned her up a bit more, swabbed the area with alcohol, and by now the uterine tissues had receded inside the cloaca. We put some warm honey (anti-biotic/anti-inflammatory) mixed with KY Jelly in and on her vent. Egg issues can be a little dicey, but here’s to a full and complete recovery for Maisie the chicken!